I would like to start off by saying that some people are struggling with laziness, but it’s not because they choose to be slothful. Some people are always tired because of a bad sleeping pattern, sleep deprivation, bad eating, thyroid problems, lack of exercise, etc. If anyone is having trouble with fighting laziness. Check out these things first. Scripture has a lot to say on this topic. Clearly we see that laziness is a sin and it also leads to poverty. Some people would rather sleep in their bed all day rather than making a living and that will be their downfall. Laziness is a curse, but work is a blessing. God worked for 6 days and on the 7th day He rested. God put Adam in the garden to work and take care of it. God provides for us through work. Since the beginning we were commanded to work. Being a sloth brings down your confidence and motivation. Slowly you start growing a bum mentality. It can soon turn into a disastrous lifestyle for some. We have to grasp the concept of working hard. There is always something to do, but sometimes we would rather procrastinate. The gospel always needs to be preached. Work hard in everything you do because working always brings profit, but too much sleep brings disappointment and shame. When you’re lazy not only do you suffer, but other people suffer as a result of it. Work to help others. Ask the Lord to strengthen your hands and to remove any slothfulness in your body. The 3 types of laziness. Physical – Neglecting work and duties. Mental – Common among kids in school. Taking the easy way out. Trying to take shortcuts. Get rich quick schemes. Spiritual – Neglecting to pray, read Scripture, use God-given talents, etc. 1. Proverbs 15:19 The path of lazy people is like a thorny hedge, but the road of decent people is an [open] highway. 2. Proverbs 26:14-16 Like a door on its hinges, a lazy man turns back and forth on his bed. Lazy people are too lazy to lift the food from their plate to their mouth. Lazy people think they are seven times smarter than the people who really have good sense. 3. Proverbs 18:9 Whoever is lazy regarding his work is also a brother to the master of destruction. 4. Proverbs 10:26-27 Lazy people irritate their employers, like vinegar to the teeth or smoke in the eyes. Fear of the LORD lengthens one’s life, but the years of the wicked are cut short. 5. Ezekiel 16:49 Sodom’s sins were pride, gluttony, and laziness, while the poor and needy suffered outside her door. Follow the example of the ant. 6. Proverbs 6:6-9 You lazy people, you should watch what the ants do and learn from them. Ants have no ruler, no boss, and no leader. But in the summer, ants gather all of their food and save it. So when winter comes, there is plenty to eat. You lazy people, how long are you going to lie there? When will you get up? We are to put off laziness and we are to be hard workers. 7. Proverbs 10:4-5 Lazy hands bring poverty, but hard-working hands lead to wealth. Whoever harvests during summer acts wisely, but the son who sleeps during harvest is disgraceful. 8. Proverbs 13:4 The appetite of the sluggard craves but gets nothing, but the desire of the diligent will be abundantly satisfied. 9. Proverbs 12:27 The lazy do not roast any game, but the diligent feed on the riches of the hunt. 10. Proverbs 12:24 Work hard and become a leader; be lazy and become a slave. Poverty is the result of the continuous sin of laziness. 11. Proverbs 20:13 If you love sleep, you will end in poverty. Keep your eyes open, and there will be plenty to eat! 12. Proverbs 21:5 Good planning and hard work lead to prosperity, but hasty shortcuts lead to poverty. 13. 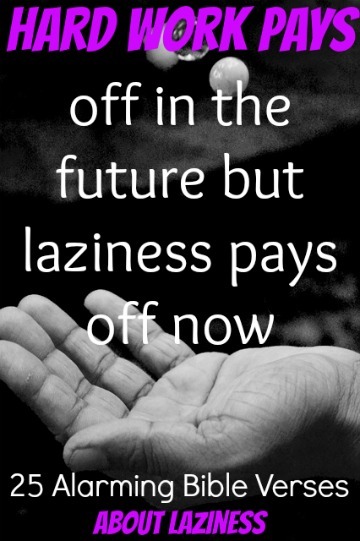 Proverbs 21:25 Despite their desires, the lazy will come to ruin, for their hands refuse to work. 14. Proverbs 20:4 The slacker does not plow during planting season; at harvest time he looks, and there is nothing. 15. Proverbs 19:15 Laziness throws one into a deep sleep, and an idle person will go hungry. 16. 1 Timothy 5:8 If anyone does not take care of his own relatives, especially his immediate family, he has denied the faith and is worse than an unbeliever. A godly woman is not lazy. 18. Proverbs 31:16-17 She considereth a field, and buyeth it: with the fruit of her hands she planteth a vineyard. She girdeth her loins with strength, and strengtheneth her arms. 19. Proverbs 31:19 Her hands are busy spinning thread, her fingers twisting fiber. 20. Ephesians 5:15-16 So be careful how you live. Don’t live like fools, but like those who are wise. Make the most of every opportunity in these evil days. 21. Colossians 3:23 Whatever you do, work at it wholeheartedly as though you were doing it for the Lord and not merely for people. 22. 1 Thessalonians 4:11 and to make it your ambition to lead a quiet life: You should mind your own business and work with your hands, just as we told you. 23. Ephesians 4:28 The thief must no longer steal. Instead, he must do honest work with his own hands, so that he has something to share with anyone in need. Slothfulness leads to procrastination and excuses.